Last day of apple week – I hope you guys enjoyed it. Today’s recipe is inspired by a dish I saw on a menu years ago. My brain is full of half baked ideas like this, that I glean from long forgotten sources. I do remember thinking how unusual cheddar sounded in a risotto but now I am sad I didn’t try it earlier! 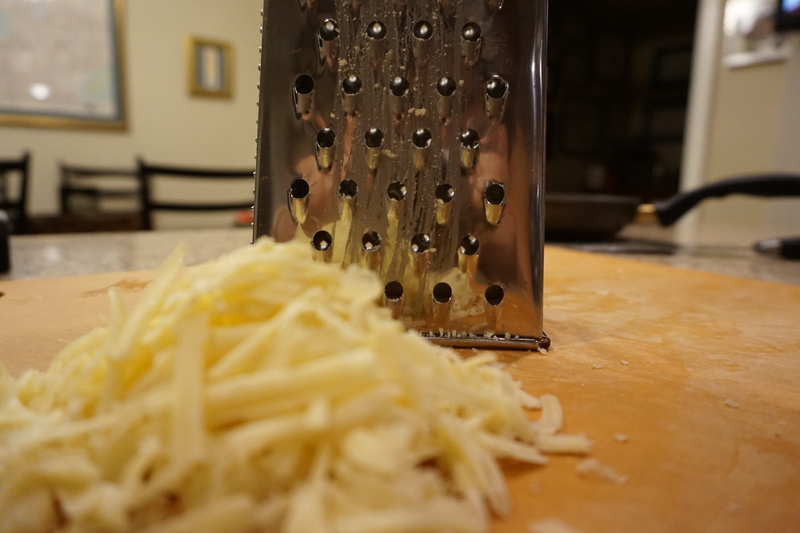 The tradition is parmesan of course, but cheddar has the same salty, nutty goodness and melts well right into the rice. To add some crunch I sprinkled the top with toasted walnuts which keeps the whole thing from tasting like baby food. Also the apple sauteed in with the shallots adds some sweetness and heft to the dish. If you have forgotten the risotto rules they are right here – but go ahead and break some for good measure. I did here when I already had some chopped onion and used that instead of the shallot. We had this with a nice green salad (and ate all 4 portions between the 2 of us!) but I think it would make a really nice starter for a fall dinner party, then it would likely serve 6. Have a great long weekend! Add the stock to a small saucepan and warm over low heat. In a high sided skillet melt the butter over medium heat, then add the shallots and apple and cook for 5 minutes. Add the rice and stir it around until all the grains are coated in the butter. Reduce the heat to medium low. Splash in the wine and use your spoon to stir the rice. Once almost all of the wine has cooked off you can start ladeling in the stock. Add 1 ladelful at a time, stirring near constantly. Once the rice starts looking dry add in another ladelful. After about 25 minutes I start checking the doneness of the rice but usually it will take closer to 30 or 35 minutes to cook. Once the rice is done (its tender with just a little bit of bite to it) take it off the heat and stir in the cheddar. Check for seasoning and add salt and pepper if needed. Top with chopped walnuts and serve immediately. Add the stock to a small saucepan and warm over low heat. In a high sided skillet melt the butter over medium heat, then add the shallots and apple and cook for 5 minutes. Add the rice and stir it around until all the grains are coated in the butter. Reduce the heat to medium low. Splash in the wine and use your spoon to stir the rice. Once almost all of the wine has cooked off you can start ladeling in the stock. Add 1 ladelful at a time, stirring near constantly. Once the rice starts looking dry add in another ladelful. After about 25 minutes I start checking the doneness of the rice but usually it will take closer to 30 or 35 minutes to cook. 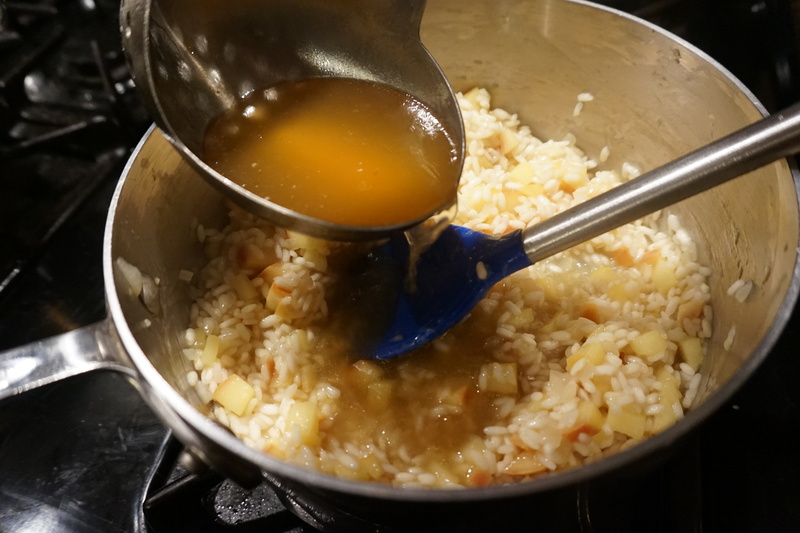 Once the rice is done (its tender with just a little bit of bite to it) take it off the heat and stir in 3/4 cups of the cheddar. Check for seasoning and add salt and pepper if needed. Top with chopped walnuts and the remainder of the cheddar and serve immediately.